From forensics and genetics to viruses and bacteria, this comprehensive 17 CD-ROM set provides an engaging and informative learning experience to supplement your lessons. Conduct simulations of cell division, crime scene investigation, bacteria/viral growth, and more. Journey through fast-paced video voyages with incredible footage and narration in both English and Spanish. 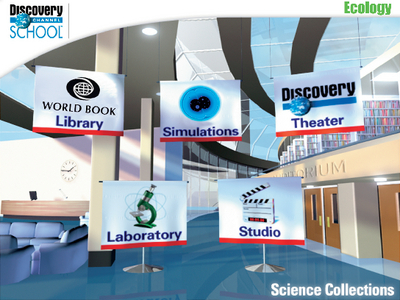 Students can also create multimedia presentations using the studio tools and then test what they learn in the laboratory assesment module. The included World Book Encyclopedia is an additional reference for research. The 17 featured titles in the collection are Bacteria, Birds, Cells, Ecology, Evolution, Fish & Amphibians, Forensics, Genetics, Health, Human Biology, Insects, Invertebrates, Mammals, Plants, Protists & Fungi, Reptiles, Viruses. Each CD includes a printable teacher’s guide.